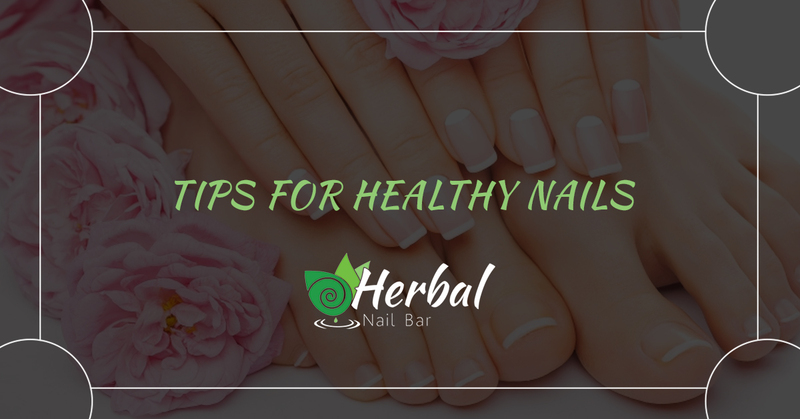 Here at Herbal Nail Bar, we are often asked by clients how they can keep their nails healthy. Thankfully, there are a few things you can do at home to keep your nails healthy and strong between appointments at our Naples nail salon. Keep reading for some helpful tips! Get your vitamins and minerals: Your nails can tell you a lot about your health. If your nails are particularly brittle, discolored, clubbed, rippled, or have suspicious lines in or under them, this could be an indication of a vitamin deficiency. Sometimes this can be solved by taking a multivitamin and eating plenty of fresh fruits and vegetables. If you are concerned about a deficiency, be sure to bring it up with your doctor. Treat your nails gently: The same way you shouldn’t open up bottles with your teeth, you shouldn’t make your nails do more than they can handle. This means taking care when working with tools and being aware of your nails when opening cans, shutting doors, or doing other things that could hurt your nails. Don’t pick at your nail polish: We know how tempting it can be to rip off your polish when your manicure finally starts to chip. However, doing so can pull up layers of your fingernail, creating weak spots. Instead, leave polish removal to the pros at your nail salon or use a gentle polish remover at home. Keep your nails hydrated: Even if your actual fingernail is covered in polish, you can still moisturize around the nail to keep the entire nail healthy. Regularly apply a high-quality lotion throughout the day, especially after you wash your hands as soap can strip the nails of healthy moisture. At night, apply petroleum jelly around the nails and on the cuticle for deep moisture. Avoid harsh chemicals: When cleaning or using harsh chemicals, make sure to wear rubber gloves to protect your skin. Additionally, be careful about using harsh polish removers and opt for the most natural options to get the job done. Leave some tasks to your nail salon: While you can file and paint your nails without risking too much, it is best to leave bigger tasks to the professionals. Tasks like trimming your cuticles, for example, should only ever be done by those trained to do so in a sanitary environment. At Herbal Nail Bar, we follow incredibly strict safety and sanitary guidelines for the protection of our technicians and our clients so you can trust that any tools we use on your nails are clean. Keep your nails clean and dry: Bacteria can grow underneath your nails and it thrives in a moist environment. For that reason, it is important to wash your hands regularly with soap and water and take extra care to dry them thoroughly. Take time to dry your feet when you exit the shower as well. Always use a base coat: Base coats aren’t just a marketing ploy for nail polish companies to sell more products — they actually serve a pretty big purpose in the health of your nails! They prevent polish from staining your nails and some base coats have strengthening elements to keep your nails healthy. Book An Appointment At Our Natural Nail Bar Here! Not all nail salons are created equal. Herbal Nail Bar is dedicated to going above and beyond what is required of us by providing an incredibly clean environment and following the best practices in the industry for cleaning our equipment (you will always get brand new single-use tools like files, buffers, and pumice stones and we sterilize our metal tools in a hospital-grade autoclave). This alone helps your nails stay healthy by preventing the risk of fungal diseases. We also only use the best all-natural products to pamper you at our nail salon, from fresh herbs and Dead Sea salt scrubs to aromatherapy food massages with high-quality essential oils. Experience the difference that a natural nail salon makes by scheduling an appointment with Herbal Nail Bar! (We always try to accomodate walk-ins, but if you need guaranteed timely service we suggest booking an appointment).